1. The 1:72 Agusta A106 mentioned in HKN #142 is now about 75% complete. 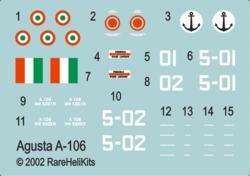 A preview of the decal sheet shows markings for the two prototypes evaluated by the Italian Navy in the late 1960's - early '70's. The company test machine colour scheme will also be included. 2. Cobra Company's newly released resin weapons set #72013 for the 1:72 Italeri UH-1B/C/F kits includes two M-134 miniguns and mounts, ammunition box, two XM-157 rocket pods and weapons pylons, and right and left side weapons support assemblies. 3. The former Crew Chief of the 37th ARRS UH-1F serial 1224 (included as an option in the new Italeri kit #1229) is a HKN reader and points out that the aircraft was based at Malmstrom AFB, Montana; not from Elsworth AFB as Italeri say in their instructions. Don't forget that to make an accurate UH-1F the main rotor blades each need to be extended by a full 16mm in length. This is most effectively done by simply taking sections from the blades of another Italeri 1:72 Huey and gluing them onto the ends of the kit blades. 4. Information slowly leaking from Zvezda confirms previous suggestions in HKN that four variants are being prepared. It's most likely that three of them will be Mi-8 variants (civil, army transport and army gunship), the latter with armour plating; the fourth being an army Mi-17. These will probably only differ in the decals and instructions provided, it seems that all the parts to build any of the variants will be in all the boxes. The Zvezda website shows an Mi-8 to be issued under the Zvezda label, #7230), and an Mi-17 to be issued under the Berkut label, #72011. I believe 'Berkut' is Russian for 'Golden Eagle'. The UK distributor of Zvezda has included the Mi-8 in their list of kits that will be available to model shops in July. 5. Trumpeter have released two 1:48 Hinds, #48310 is a Mi-24D, while #48311 is a Mi-24P (Hind-F). They seem to owe their origins to the Revell/Monogram kit, but have been 'enhanced' somewhat with engraved panel lines, rivets, and minor detail changes, not all of them necessarily beneficial. It is said that the additional runners that hold the cannon and larger rocket pods for the F variant are "woefully innacurate" in comparison with Cobra Company's resin updates for the Revell/Monogram kit. There seems to be some debate about just how many issues are actually involved here, but Hannants are selling kits with "Mini Hobby Models" written on the box as Trumpeter items, so I'm inclined to believe that these two brands are one and the same. 6. Aero Dancing have released their 1:72 transparent AH-64D Apache Longbow. Hobbylink Japan tell us that this is "Hasegawa's fine AH-64D kit repackaged with decals to mark the plane as it appears in the Japanese release of the Sega Dreamcast video game Aero Dancing F."
HKN's limited researches into this game have revealed only screenshots of Apaches in anonymous helo-drab schemes, so the nature of these markings is unclear. 7. 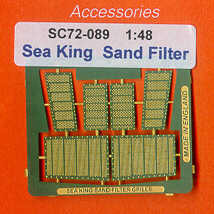 The Airwaves 1:48 resin and etched brass Sea King sand-filter box #SC48089 is now available. This is designed for conversions based on the Hasegawa (Revell) 1:48 Sea Kings. 8. Verlinden's new AH-1W Cobra detail set #1795 is now on sale. Included are a resin cockpit, ammo bay, a replacement 3-barrel cannon, and some etched brass details for the rotor. 10. Aires are intending to produce a 1:48 resin cockpit for the Hasegawa AH-64A Apache, #4131. 12. Also in the USA, Linden Hill now have the Whirlybird Dauphin decal sets for G-HEMS in the yellow 'Express Newspapers' and red 'Virgin' schemes. 13. 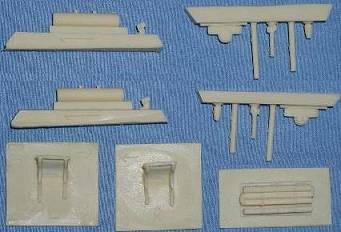 The existing Hawkeye/Model Alliance helicopter resin conversion parts are being discontinued. The Aviation Workshop will be producing a revised range of these in the UK from about September this year. Once current stocks of Model Alliance helicopter decals have been sold out, no more of these will be produced until September either. 14. Geoff Arnold, caretaker leader of the dormant IPMS Helicopter Special Interest Group, asks that former members contact him with their current email addresses, since his address book was lost as a result of hardware failure. Geoff tells us that he has booked space at the 2002 IPMS UK Nationals for a SIG display. Thanks to Jason van Lint, George Filyagin, Chris Miller, Gary Madgwick, Tony Morgan, Chris Lenahan, Tim Vereecke, Rolando Raffaut.